Villains of All Nations explores the Golden Age of Atlantic piracy and the infamous generation whose images underlie our modern, romanticized view of pirates. The high-seas drama of 1716-1726 featured the dreaded black flag, the Jolly Roger; swashbuckling figures such as Blackbeard; and the unnamed pegleg pirate who was likely Robert Louis Stevenson’s model for Long John Silver in Treasure Island. Rediker shows how sailors emerged from deadly working conditions on merchant and naval ships, turned pirate, and created a starkly different reality aboard their own vessels. At their best, pirates constructed an egalitarian society starkly at odds with the social hierarchy of their time. They elected officers, divided their booty equitably, and maintained a multinational social order. Villains of All Nations is an unprecedented social and cultural history of life on the high seas; it delves into the myths and realities of pirate life that captured the popular imagination in their day and continue to do so in ours. "Marcus Rediker knows pirates, and he knows how to tell a story. Villains of All Nations is a must read; don't wait for the movie!" "[Pirates] created life under the flag of death, liberty in a world of despotism, and equality where hierarchy dwelled. They also made an already savage world more barbarous. Understanding these conundrums requires placing the Jolly Roger in the context of history while respecting its place in the popular imagination. Marcus Rediker accomplishes both tasks with intelligence, insight, and balance, attentive both of the lives pirates would live and of the lives they did live." "Immensely readable . . . [Villains of All Nations] provides penetrating background to our enduring cultural fascination with the seafaring outlaws." 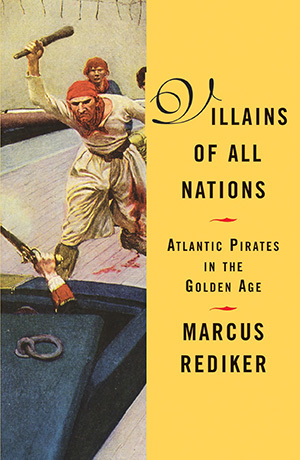 "Rediker's pleasingly taut and lucid book is a minor classic in what is now becoming the fascinating sub-genre of 'piracy studies.'"